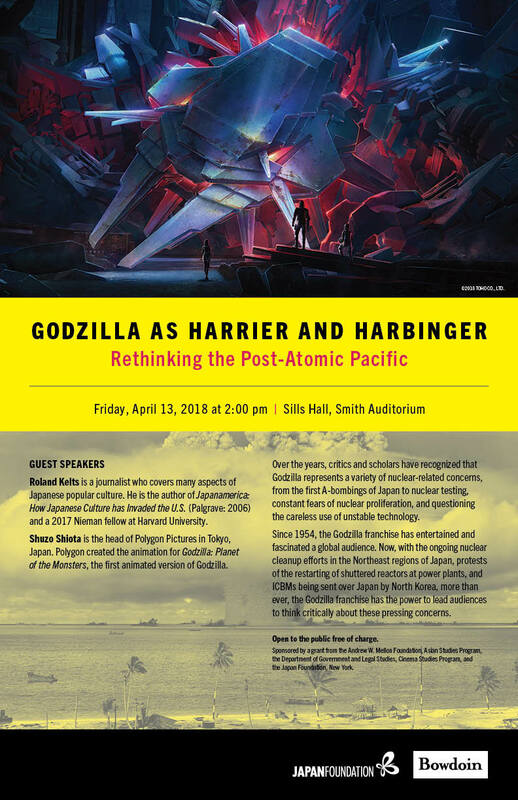 The Asian Studies Program at Bowdoin College would like to invite you to “Godzilla as Harrier and Harbinger: Rethinking the Post-Atomic Pacific” on April 13 at 2:00PM in Sills Hall, Smith Auditorium. 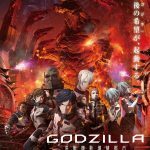 Released in Japan with great acclaim (Polygon Pictures, 2017) “Godzilla: Planet of the Monsters” is the first CGI/Anime production in the Godzilla franchise. This exciting chapter in the Godzilla saga is beautifully animated and tells a captivating tale. Please join us for a rare opportunity to hear from noted Japanese popular culture expert, Roland Kelts, and the president of Polygon Pictures and producer of “Godzilla: Planet of the Monsters,” Shuzo Shiota, as they discuss aspects of the production of this new CGI animation, the animation industry, and the cultural importance of Godzilla. As the menacing figure of Godzilla reminds his global audience of the problems of atomic technology and nuclear weapons, he has become an important conversation starter. As he takes revenge on a humanity that recklessly abuses technology and unleashes radiation into the environment, his message is as important for us today as it was when he first emerged from the depths of the sea in 1954. Following our main presenters, a panel of experts on Japanese history, international relations, marine biology, and Japanese literature will join the discussion as we examine the enduring effects of nuclear pollution and the anxieties of possible nuclear proliferation in the pacific region. Roland Kelts is the author of the critically acclaimed and bestselling book, Japanamerica: How Japanese Pop Culture has Invaded the US. 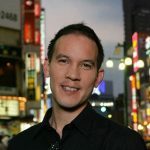 He writes for many publications in the US, Europe and Japan, such as The New Yorker, The New York Times, Harper’s Magazine, The Christian Science Monitor, The Guardian, Time magazine, Newsweek Japan, The Yomiuri, The Japan Times and others. He has interviewed several notable Japanese artists, including Hayao Miyazaki and Haruki Murakami, and is considered an authority on Japanese culture and media. He is also a frequent media commentator on CNN, NPR, NHK and the BBC. Recently, Kelts gave speeches at The World Economic Forum in China and TED Talks in Japan, and he was a 2017 Nieman Fellow in journalism at Harvard University. This summer he will begin teaching at Waseda University, his grandfather’s alma mater. He lives in Tokyo. A recent article of his featured in The Guardian may be read here. Shuzo John Shiota, president of Polygon Pictures was raised in the United States and is a graduate of the Sophia University Faculty of Law, Department of International Legal Studies.After joining the Nippon Steel Corporation in 1991, Shiota went on to participate in the launch of Dream Pictures Studio in 1997. He moved to Polygon two years later and in 2003 assumed the position of President and CEO. As studio head Shiota has spearheaded efforts to cultivate Polygon’s overseas presence, helping the studio to become a leading developer of TV series and content targeted at the foreign market. 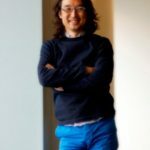 Shiota has also served as a judge at major Japanese and international film festivals including Prix Ars Electronica (AUS) and SIGGRAPH (U.S.). In 2008, he was selected as one of the “25 Toon Titans of Asia” by popular industry publication Animation Magazine. He also presided as a judge at the 2016 Annecy International Animated Film Festival. His hobbies include playing in a band. This event made possible by generous funding from the Andrew W. Mellon Foundation, the Bowdoin Asian Studies Program, the Department of Government and Legal Studies, the Cinema Studies Program and the Japan Foundation, New York.